Finding Wonderland: The WritingYA Weblog (archive): Toon Thursday: Another Contest Winner! Toon Thursday: Another Contest Winner! Thank you, a. fortis! It's a thrill to be illustrated. 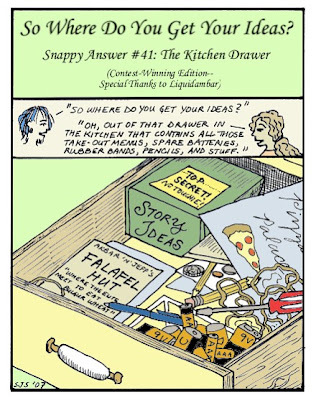 You captured my kitchen drawer without even visiting my house. How spooky is that? It's in a box, unfortunately, I'm sure. At least your drawer has one of every kind of battery. I always seem to have fifteen AAA's and no 9V or whatever it is that will make the smoke alarm stop beeping at me. Maybe I need some writer batteries in there, too. Can't wait to see the rest in this series! Congratulate Minh: The Bottom Shelf Is Booked! Could Shawna Tenney be any more adorable? Robert's Snow: Gretel Parker's "Snow Rabbit"
Aaaargh! MotherReader Where ARE YOU!?!?!? Toon Thursday: Grand Prize Winner!! Looking and Pointing and Saying "Oooh!" Toon Thursday--Last Day to Enter Contest! Oddly Fantastic, She's a Wall?